The South Loop is a vibrant, growing, exciting new community attracting many urban dwellers who wish to live, work, and play all in the same area. 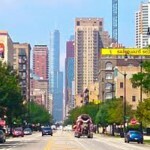 The area directly south of Chicago’s downtown Loop, South Loop offers easy access to the financial center of Chicago, as well as Soldier Field and the Museum Campus. The many high-rises give the area almost an “extension-of-downtown” feel. Bordered by Jackson, Roosevelt, Michigan, and the Chicago River to the west, South Loop is rapidly growing in popularity. There are many attractive housing choices here, with the Printers row offering condos and lofts converted from former warehouses, printing plants, and other historic buildings. Mixed with this vintage charm is a large number of flashy new high-rise buildings, offering spectacular views of the city and lake, along with all the amenities you would expect in such great new construction. Chicago’s Museum Campus, made up of the Shedd Aquarium, Field Museum, and Adler Planetarium, offers education and culture each and every day of the year. Surrounded by Lake Michigan, the campus is as beautiful as it is popular, and South Loop residents enjoy their close proximity to this Chicago hallmark. Many promising artists visit the area, as the South Loop is also home to the School of the Art Institute and Columbia College. As South Loop grows in popularity, a multitude of exciting new restaurants and hotspots keep up with residents’ demand for fun and first-class entertainment. The South Loop is ideally located for transportation anywhere in the city and beyond. Just steps from the Loop, residents have access to every train line offered by the CTA. All of the major highways are readily accessible as well: Dan Ryan, Kennedy, and Eisenhower all run close by.